Ride the high seas on our Spanish Galleon. This climb and inflatable bounce house combo includes a 17ft slide. The attraction is sure to be a hit with children of all ages. Riders enter on the right entrance, climb up a rock climbing wall, then go down the inflatable slide. 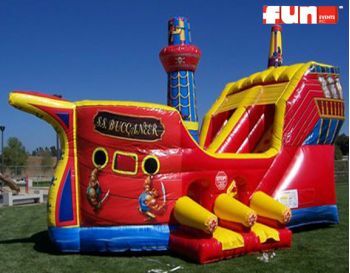 At the bottom of the inflatable buccaneer pirate ship slide is a play area for jumping and bouncing.